We’re in Bourg d’Oisans. In a cute little cafe. Twiddling our thumbs. Zakayo and Mwangi are out training. Big day tomorrow – they’re attempting Alpe d’Huez again. Everyone’s betting on an even better time. Nick needs them to do well in order to prove they can ride with the best. Others though, have already made up their minds. 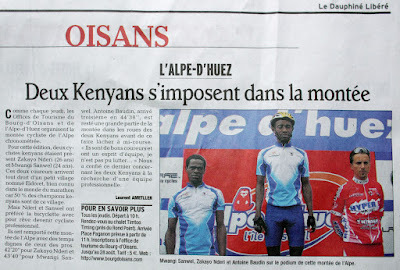 The local paper is calling the Kenyans’ first climb ‘an attempt worthy of professionals’. Not bad for a shoeshine boy and a bicycle taxi rider, no?